Hedon revolutionised the industry when it introduced the first fully automated soluble salt meter. 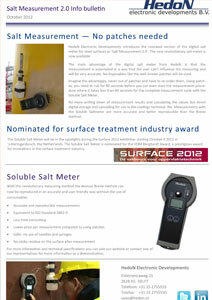 The soluble salt meter 2.0 is a price competitive and eco friendly solution for the determination of salts on the job. The rugged salt meter is perfect for use in all industrial environments and Its USB data output allows for quick retrieval and dissemination of recorded data.